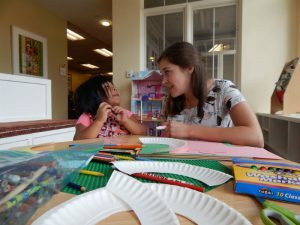 The following is a blog written by one of RMHCA’s summer interns, Abbie Gordon. Before I started my internship this summer, I really did not know a lot about the Ronald McDonald House. I knew that families could stay at a house when they had a child being treated at a nearby hospital and I knew that it was a place that aimed to feel like home. Throughout the course of my internship, my eyes have been opened to the smallest of details that make this House run like a home that fosters an atmosphere of hope. Abbie (left) helps one of the children make a craft. The staff works hard – I mean really hard – to raise money, recruit volunteers, and provide a safe a loving place for families to lay their heads. To say that this staff cares about what they do is an understatement. There is always someone at the House before I arrive and even on nights when I stay late, someone usually is walking out after me. They love the mission for RMHCA and that’s why they do what they do with such ease. Keep up the hard work, everyone, and take time to realize the impact you have! As the intern this summer, I was able to assist in some way with all departments that make up RMHCA. I learned about events and fundraising, assisted with family programming, delved into volunteer organization, and practiced hospitality at the front desk. I gained a wealth of information that cannot be grasped in the classroom alone. As a Hospitality Management major, it’s natural for me to enjoy caring for people. This was a large draw for me in coming to the Ronald McDonald House. In being an intern, I have been able to indirectly and directly care for many families. I get to see firsthand the smiles, hear the laughs, and watch the tears of moms, dads, grandparents, and children as they express their thanks for all that the Ronald McDonald House provides. From meals, to crafts, to friendly waves and helping hands, these families give great thanks. So now I do the same. Thank you for letting me be a part of the life of RMHCA for a short time. I’ve learned more than I could have imagined and my heart has been overwhelmed with the joy that has surrounded this internship. RMHCA is currently accepting internship applications for Spring 2018! We have openings for a general and a marketing intern. We are also attending several volunteer/internship fairs at local colleges, so check out our events calendar for those dates!